Each chest shop sign has four lines on it. Line 1: The item that can be bought or sold to/from the chest shop. The name or number value may or may not be what you’re familiar with as the name of that item. When left-clicking the sign, it’ll possibly show you an alternative name for that item. Line 4: The owner of the chest shop. To buy from a shop, simply right-click the shop sign (not the chest) with the currency, indicated at the end of line 2, in your hand. To sell to a shop, right-click the shop sign with the item(s) in your hand. You need a chest with a wall right up behind it to place a sign on. This can be in the Final City market or anywhere else you choose. The market shop areas in Final City are managed to keep them active, so you may have to ask for permission to setup shop there. Once you’ve placed the sign on the block above the chest, you follow the pattern seen on other chest shops. The item name must be exact (though capitalization doesn’t matter). Use the Bukkit material names or fall back to id:data values. The first letter of line 2 & 3 must be capitalized for the sign to work. You do not have to put your name on the last line. It will be put there automatically. After you’re done, you know it’s a success if it puts your name on the sign. Fill the chest with what you’re selling, and then double check that it’s working and you have the correct name by left-clicking the sign. It should tell you the correct quantity of that item, also. If you’re buying stuff back from people (with the 3rd “Sell” line) make sure to put the currency in the chest. Remember, be fair and have fun! Posted in Guides on February 13, 2012 . Quick question- why is glowstone SO expensive? Not THAT hard. 4 gold for 1 glowstone? The problem is that it is semi-difficult to get, especially since most has been mined out of all three nether dimensions already. All that remains is hidden caches, lodes just beyond the world border, and occurrences that are just flat out difficult to get to (require building a long bridge + platform). This is a problem that I’m probably going to address again. (we had rebooted the nether a couple times in the past… you’re just late to the party) I think I’ll restore the glowstone using worldedit, then use logblock to rollback (ie. grow back) the glowstone on a regular basis. But we’re also going to run out of nether brick eventually too, so we’ll see… maybe if we ever get a new world again, I’ll make the new nether reboot every day or something. Prices are set by players, not by absolute value. If it’s not worth the price, don’t buy it. There is some glowstone at the coin redemption shop in Final City. 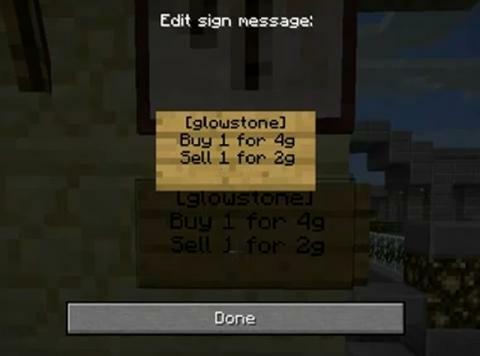 But also you can run “/listshops buy glowstone” to see if any shop owners have some in stock. I now have a glowstone shop with good prices, if you still need it. hey, i’m not sure that you KNOW me in Minecraft, but i now have a small general store that sells flowstone for 1 iron. good deal eh? Your YouTube embed is broken. I looked at the source and found the link http://www.youtube.com/v/http://www.youtube.com/watch?v=mAxm3DQ5Wqk — looks like an invalid url. Ah yes, we changed our embedding method a month ago and I missed this one. Thanks. A great site with item ID numbers and names. I’ve found it to be more user friendly than the links at the end of the guide. The Bukkit material names are what you have to use if you want to use a word instead of numbers, otherwise the id:data values are a good fallback. Do not use the names from that site. That’s actually the website I use now. The ones posted in the guide are significantly changed since I posted it and it’s no longer as useful as it once was. I’ll update them.